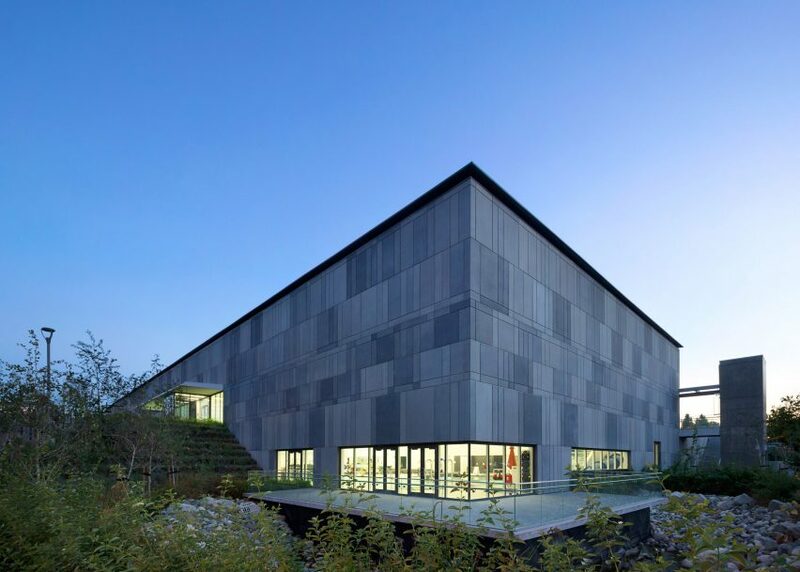 Canadian studio Bing Thom Architects has completed a community swimming pool building in suburban Vancouver, with a roof made from a series of giant trusses and skylights (+ slideshow). 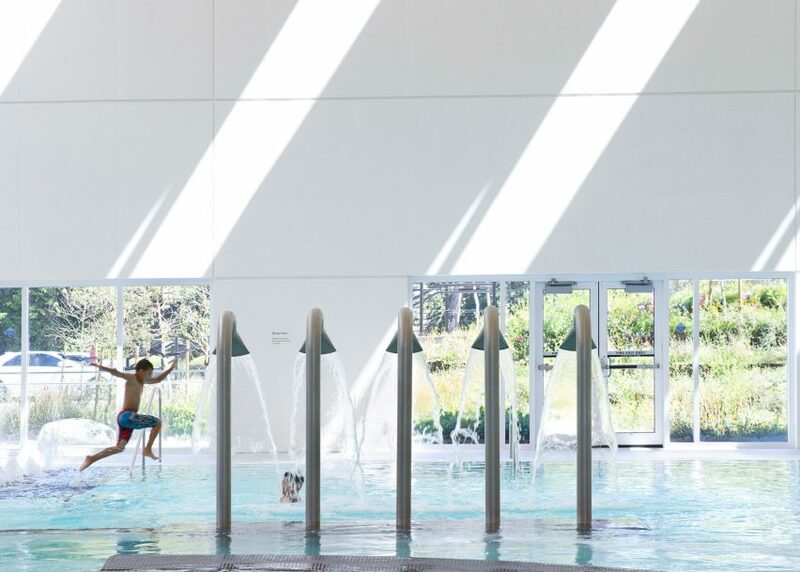 Encompassing 6,967 square metres, the Guildford Aquatic Centre is an addition to an existing recreational facility in Surrey – a suburban community just outside of Vancouver. The new building accommodates swimming, water polo and other aquatic sports and activities. In addition to a 50-metre lap pool certified by the International Swimming Federation, the facility houses a leisure pool with a therapy area and walking lanes. It also contains a jacuzzi, a lazy river, a water slide, a sauna and a steam room. 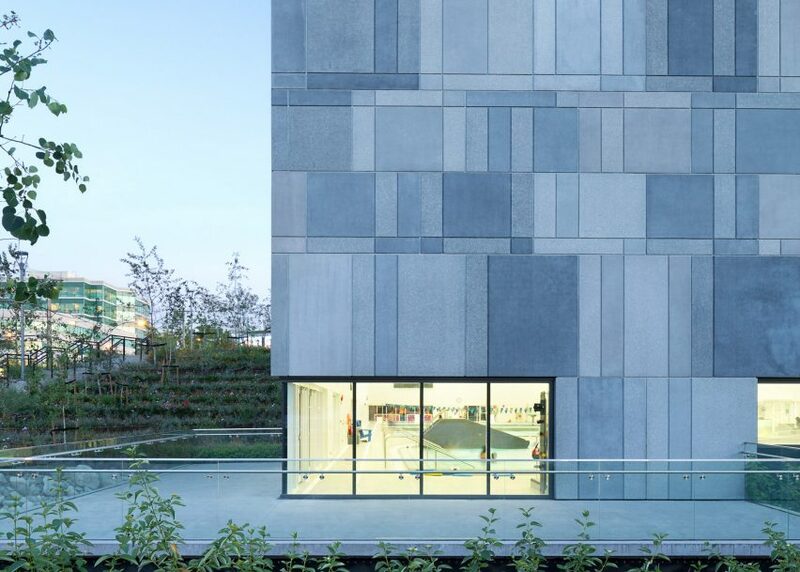 Rectilinear in form, the building has exterior walls made of glass and multicoloured concrete – a pairing of materials that results in a "rhythm of solid and void". Inside, the design team used a light colour palette that gives the space an airy and clean feel. 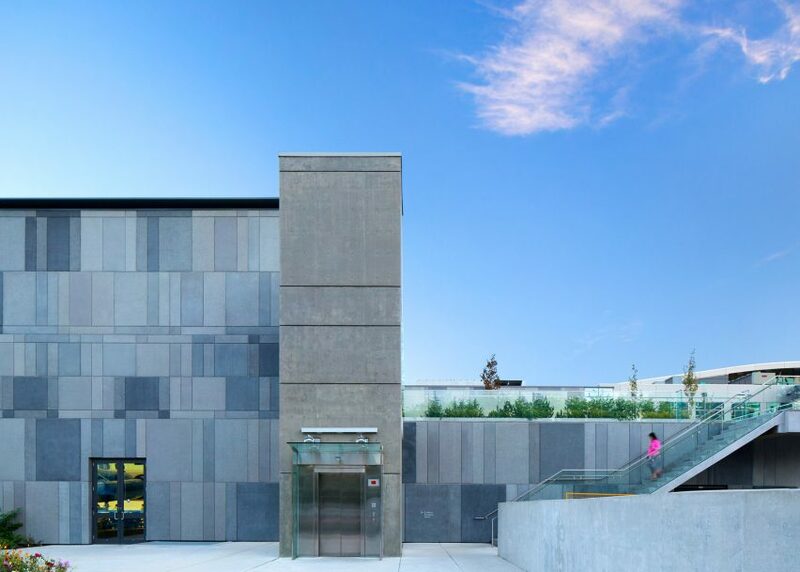 "The design is conceived as a magic box, with the pixelated precast concrete exterior acting in tension with the white-pearl natatorium interior," said Bing Thom Architects, a Vancouver-based firm established in 1982. Resting on a gently sloping site, the building is encircled by a fluid, choreographed landscape that contrasts with the building's straight lines. Terraced gardens — which are visible from the interior pool deck – help with stormwater management while also serving as a natural habitat. Above the gardens is a meandering pathway that leads to the main entrance. Visitors pass through a reception area, with changing areas located below ground. They then step into an expansive pool house with a soaring ceiling. An elevated glass-walled bridge stretches across the room. During the day, the space is bathed in natural light. 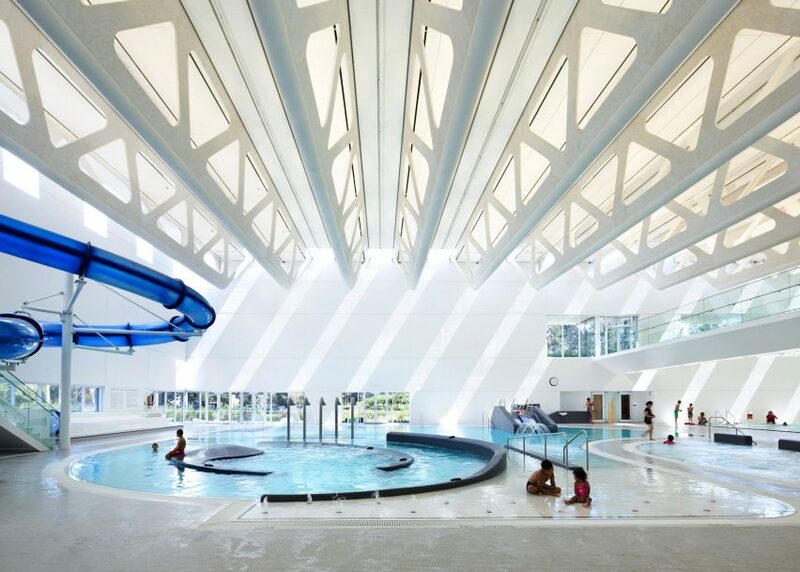 "Early in the design process, it was determined that lighting would be used as one of the principle elements of the natatorium," the firm said. "The desire was to maximise the impact of sunlight while acknowledging the heavy energy consumption notorious with this building type." A major challenge was figuring out how to incorporate glazing while minimising heat gain and loss. 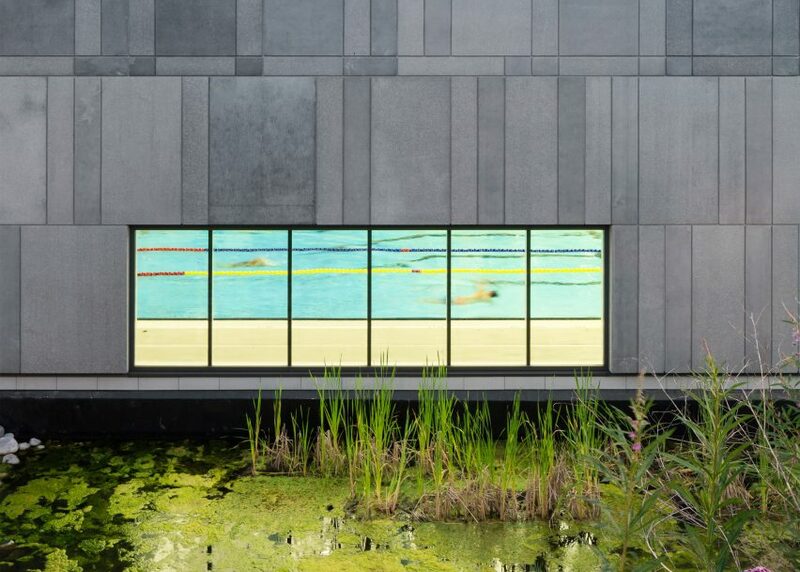 The team opted to strategically place windows in areas where daylight would be maximised but glare at the water level would be reduced. Windows at the pool-deck level provide framed views of the exterior, while skylights brings in light from above. Tint and gloss levels for wall finishes were carefully chosen, in order to achieve the right amount of reflectivity. 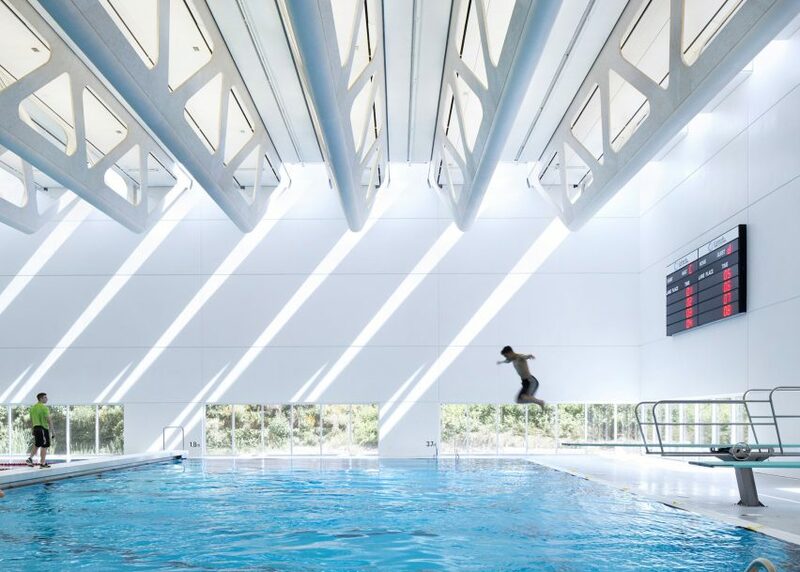 "The continuous ribbon of skylights allows beams of sunlight to streak across the walls and move with the time of day, enhancing the animation of the natatorium," the architects said. The main feature of the interior is a wooden truss system, a material choice that stemmed from a city initiative that encourages the use of wood. The system consists of 22 V-shaped trusses that were prefabricated and transported to the site. "We worked closely with the design-builder to create a pre-assembled truss fully integrated with lighting, mechanical services and acoustic absorption," the team said, noting that the trusses were installed with the services in place. "This allowed for rapid, on-site assembly with no scaffolding." In addition to being a renewable material, the wood is easy to maintain and resistant to corrosion. 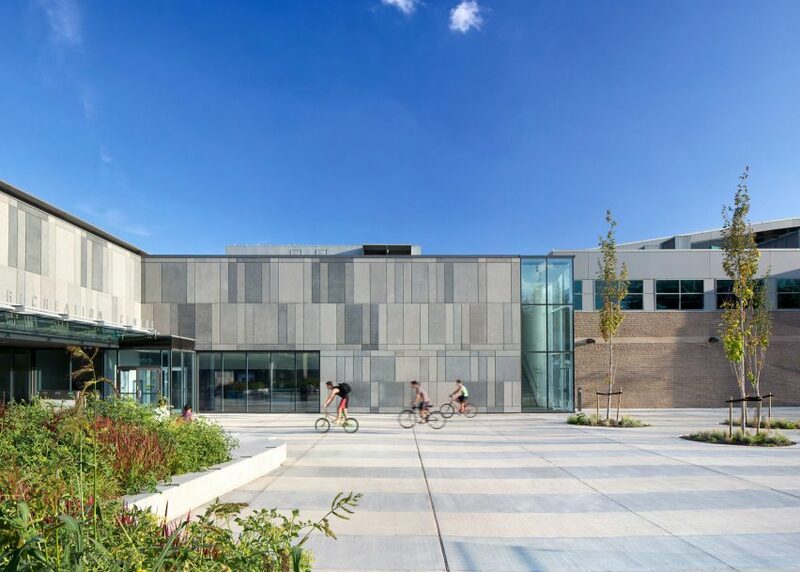 "As the prime architectural feature in the natatorium, the wood truss provides both economical and unique solutions to the structural and operational requirements of the facility," the architect said. 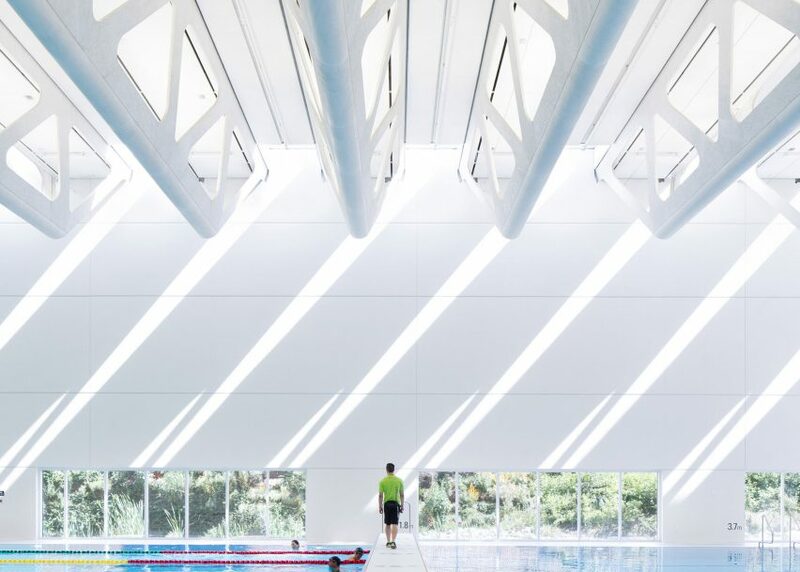 Other community pool houses include a facility in Spain's Basque Country clad in metal and glass and a renovated concrete natatorium in a Parisian suburb.